A median, segmented, annelid nerve cord has repeatedly been compared to the arthropod and vertebrate nerve cords and became the most used textbook representation of the annelid nervous system. Recent phylogenomic analyses, however, challenge the hypothesis that a subepidermal rope-ladder-like ventral nerve cord (VNC) composed of a paired serial chain of ganglia and somata-free connectives represents either a plesiomorphic or a typical condition in annelids. Using a comparative approach by combining phylogenomic analyses with morphological methods (immunohistochemistry and CLSM, histology and TEM), we compiled a comprehensive dataset to reconstruct the evolution of the annelid VNC. Our phylogenomic analyses generally support previous topologies. However, the so far hard-to-place Apistobranchidae and Psammodrilidae are now incorporated among the basally branching annelids with high support. Based on this topology we reconstruct an intraepidermal VNC as the ancestral state in Annelida. Thus, a subepidermal ladder-like nerve cord clearly represents a derived condition. 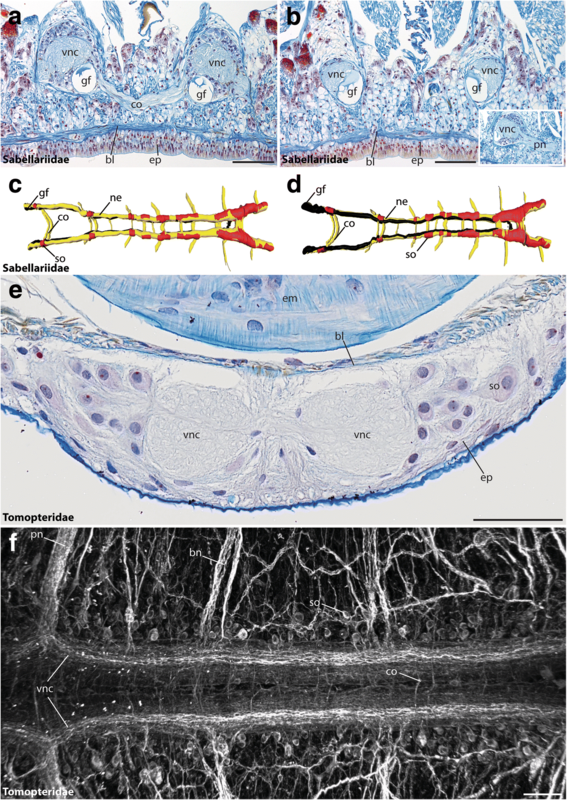 Based on the presented data, a ladder-like appearance of the ventral nerve cord evolved repeatedly, and independently of the transition from an intraepidermal to a subepidermal cord during annelid evolution. Our investigations thereby propose an alternative set of neuroanatomical characteristics for the last common ancestor of Annelida or perhaps even Spiralia. A rope-ladder-like organization of the ventral nerve cord (VNC) has often been regarded to represent the ancestral condition of annelids [1–6]. According to this traditional view, the VNC in Annelida consists of a chain of paired ganglia containing the neuronal somata, linked longitudinally by parallel somata-free connectives and transversely by segmental commissures. 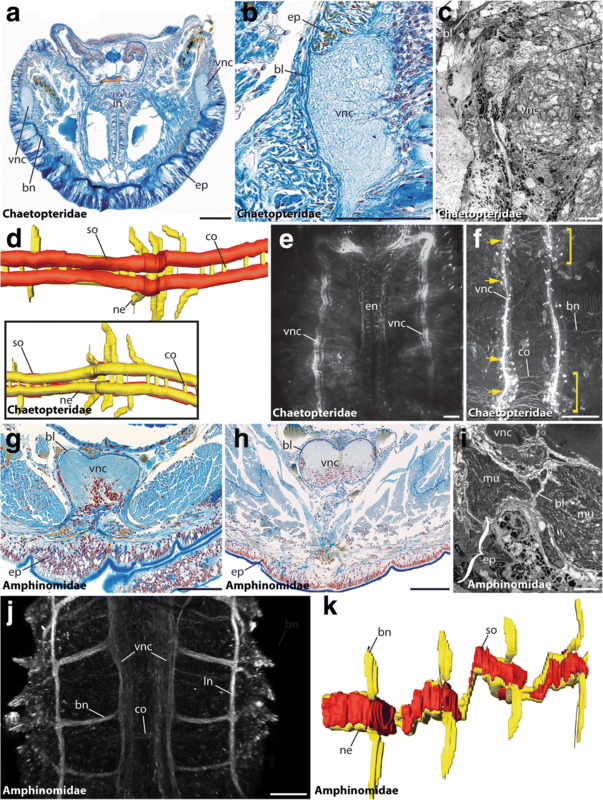 The organization, development and cell types of the annelid mid-ventral cord are best investigated in the annelid model organisms Capitella teleta Blake, Grassle & Eckelbarger, 2009, Helobdella robusta Shankland, Bissen & Weisblat, 1992 and Platynereis dumerilii (Audouin & Milne Edwards, 1834) [7–14]. Gene expression studies in these annelids inspired wide reaching comparisons of the annelid VNC to that of arthropods and vertebrates (e.g., [15–17]). Nonetheless, the annelid VNC shows a great diversity in number and position of neurite bundles and localization either within or beneath the epidermis [1, 18–20]. 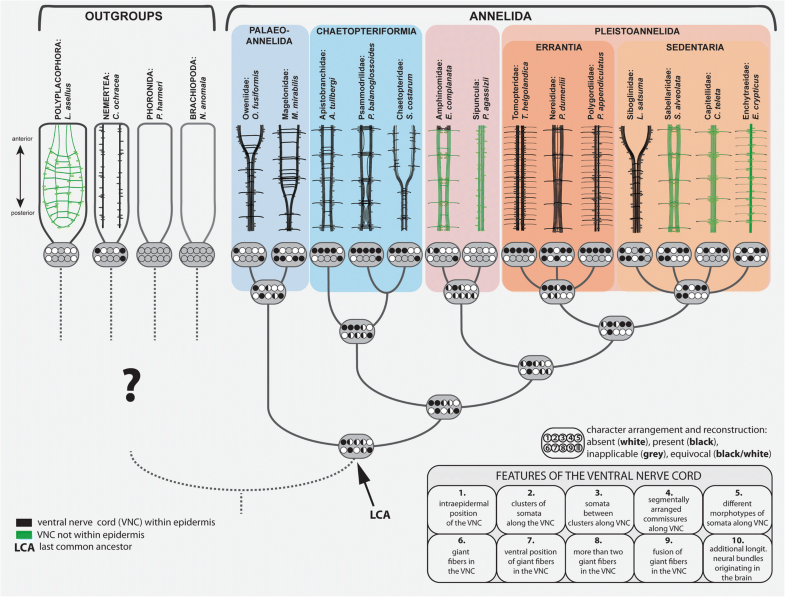 Accordingly, the hypothesis that the ladder-like VNC is ancestral was often questioned [20–23] and challenged repeatedly, e.g., by a hypothesis regarding a pentaneuralian arrangement of the neurite bundles in the annelid VNC as ancestral [1, 18, 24] and by the finding of an unpaired mid-ventral nerve cord in numerous taxa [14, 20, 23, 25–27]. 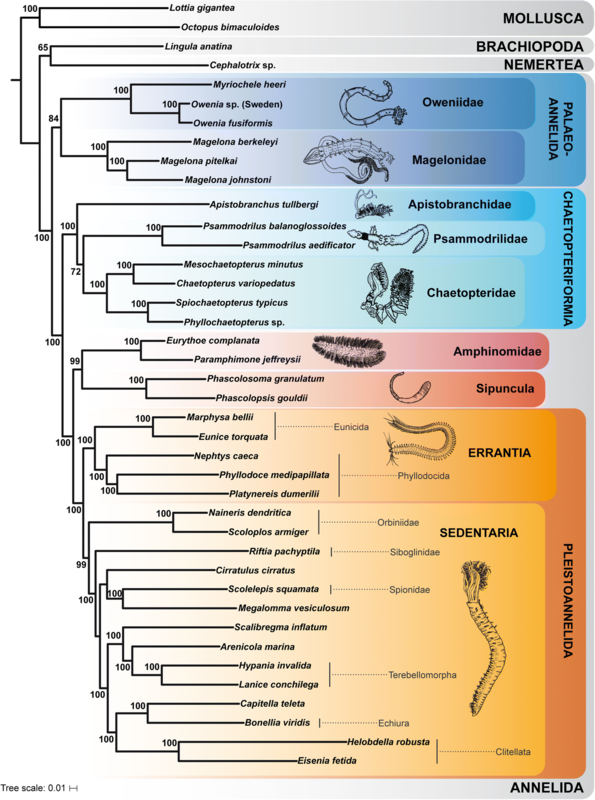 Recent, well-supported phylogenomic analyses [28–32] revealed that previous profound investigations into annelid neuroanatomy unfortunately focussed on representatives of derived annelid subgroups, now united as Pleistoannelida [1, 18, 20]. However, investigations of several taxa placed outside this main clade are underrepresented so far. For instance, Magelonidae and Oweniidae together (as Palaeoannelida) represent the sister taxon of all other annelids . Subsequently, Chaetopteridae and a clade comprising Sipuncula and Amphinomida branched off. Comparative neuroanatomical investigations focussing on these non-pleistoannelid taxa are still limited [33–37]. Moreover, several groups that were so far difficult to place in the annelid tree but were sometimes also considered as possibly early-branching, namely Apistobranchidae and Psammodrilidae, were neither included into recent phylogenomic or morphological studies [28–30, 32, 38, 39] nor examined in detail concerning their neuroanatomy [40–42]. In order to understand the VNC evolution in Annelida we investigated this character complex within these so far neglected non-pleistoannelidan taxa. Therefore, we examined the trunk nervous system of 19 taxa with focus on the position of the VNC within or outside the epidermis, the arrangement and immunoreactivity of neurite bundles within the VNC, the appearance of additional neurites such as giant fibers as well as shape, arrangement and location of neuronal somata along the VNC. Further special attention was given to presence or absence of somata-free connectives and commissures along the entire VNC. Moreover, we updated previous phylogenomic datasets with the hitherto neglected groups Apistobranchidae and Psammodrilidae. Combining these transcriptomic analyses with immunohistochemistry and confocal laser scanning microscopy (CLSM), histological Azan staining and transmission electron microscopy (TEM), we compiled an updated phylogenomic tree and a comprehensive neuroanatomical dataset. Our results provide the background for a better understanding of the nervous system evolution within Annelida and Spiralia in general. We collected fresh specimens of several species for our study, representing 14 annelid families: 10 species solely for RNA extraction and subsequent transcriptomic analyses and 24 species for morphological investigations. For further details, please refer to Additional file 1: Table S1. Divergent collection and fixation details are specified were required and references are given below. RNA extraction and library construction were conducted as described in detail in Weigert et al. . Newly constructed libraries, as well as several libraries only shallowly covered in previous analyses , were sequenced on an Illumina HiSeq 2500 100 bp paired-end. Base calling was performed with freeIBIS , adaptor and primer sequences were removed, low complexity reads and false paired indices were discarded. Raw data of all libraries were trimmed by applying a filter of Phred 15. Data for additional taxa were obtained from NCBI (National Center for Biotechnology Information (NCBI) run by the National Institutes of Health) (see Additional file 2: Table S2). Libraries were assembled de novo using either the CLC Genomics Workbench 5.1 (CLC bio, Århus, Denmark) or Trinity . A list of all taxa used and the source of data is given in Additional file 2: Table S2. Orthology prediction was performed using HaMStR . The applied core-orthologs set comprises 1,253 orthologous genes downloaded from the Inparanoid database . Capitella teleta, Helobdella robusta, Lottia gigantea, Schistosoma mansoni, Daphnia pulex, Apis mellifera, and Caenorhabditis elegans served as primer-taxa. Redundant sequences were eliminated using a custom Perl script . Alignments for each orthologous gene were generated separately using MAFFT  and alignment masking was performed with REAP . All masked single gene alignments were concatenated into a supermatrix using a custom Perl script. To reduce potential problems of missing data we compiled two data matrices using the program MARE  with weighing parameters of α = 1.5 and α = 2, resulting in two differently densely covered supermatrices. We used partition finding and model testing as implemented in IQ-TREE  for both supermatrices, subsequently analysed under the Maximum Likelihood optimality criterion as implemented in the same program. Bootstrap support was estimated from 1000 pseudoreplicates. Adult specimens were fixed (see Additional file 1: Table S1 for species details), stained and analyzed as described in Beckers et al. . Thus, the specimens were fixed overnight in Bouin’s fixative modified after Dubosque-Basil, dehydrated in an ethanol series and incubated in methylbenzoat and butanol. Afterwards the samples were pre-incubated in Histoplast (Thermo Scientific, Dreieich, Germany) and embedded in Paraplast (McCormick Scientific, Richmond, USA). 5 μm thick sections were made using a Reichert-Jung Autocut 2050 microtome (Leica, Wetzlar, Germany) and transferred to albumen-glycerin coated glass slides. Sections were stained with Carmaulaun, differentiated with sodium phosphotungstate (5%), washed in distilled water, stained in aniline blue orange G and subsequently embedded with Malinol (Waldeck, Münster, Germany). In Azan staining, the neuropil of the nervous system stains gray, the nuclei of cell somata stain red, the extracellular matrix stains blue and the musculature stains orange . Each section was digitalized at 40× magnification using a slide scanner (Olympus dotslide (2.2 Olympus, Hamburg) and aligned using IMOD  and imodalign (http://www.q-terra.de/biowelt/3drekon/guides/imod_first_aid.pdf). 3D reconstructions were performed with Fiji (1.45b) , trakem  and Amira (4.0). For electron microscopy animals were either fixed in 1.25% glutaraldehyde buffered in 0.05 M phosphate buffer containing 0.3 M NaCl for 1 h, rinsed several times in the same buffer and postfixed in 1% OsO4 buffered in the same manner (for Owenia fusiformis, Magelona mirabilis, Spiochaetopterus costarum, Chaetopterus variopedatus and Psammodrilus balanoglossoides), in 2.5% glutaraldehyde/0.1 M sodium cacodylate/0.24 M NaCl and subsequently post-fixed in 1% OsO4/0.1 M sodium cacodylate/0.24 M NaCl (for Apistobranchus tullbergi) or in a phosphate-buffered mixture of sucrose, picric acid, glutaraldehyde and paraformaldehyde (SPAFG), according to Ermak and Eakin , for 2.5 h at 4 °C and rinsed in 0.075 M phosphate buffer adjusted to seawater with sucrose (7 changes, 2 h) (for Eurythoe complanata and Paramphimone sp.). In the latter case specimens were post-fixed in 1% OsO4 in the same phosphate buffer for 1 h at 4 °C, otherwise the specimens were stained for 30 min in 2% OsO4/1.5% potassium ferricyanide/0.1 M sodium cacodylate followed by incubation in 2% aqueous uranyl acetate for 30 min. Dehydration of the samples was performed gradually in a graded ethanol or an ascending acetone series and then with propylene oxide. All steps were conducted at room temperature. Following embedding (using the TAAB Araldite 502/812 kit or Epon-Araldite 812 kit), ultrathin sections (70 nm) were cut with a Leica Ultracut E, UC6 or UC7 and counterstained with 2% uranyl acetate and lead citrate. Images were acquired on JEOL 1011, Zeiss EM 902A, Zeiss EM 10CR, Zeiss Lyra or Zeiss Libra 120 transmission electron microscopes equipped with an Olympus MORADA or a 4 K TRS (Moorenweis, Germany) camera. Figures were adjusted to 8-bit grey scaling with the Analysis software package. All final panels were prepared using Adobe (San Jose, CA, USA) Photoshop CC and Illustrator CC. Although the specificities of the employed antibodies have all been established in numerous invertebrates, we cannot fully exclude that a given antiserum may bind to a related antigen in the investigated specimens. We hence refer to observed labelled profiles as exhibiting antigen-like immunoreactivity (−LIR). For subsequent staining, at least five specimens of each taxon where used (see electronic Additional file 1: Table S1 for details). Antibody staining was preceded by tissue permeabilisation for at least 1 h in 0.1 M PBS containing 0.1% NaN3 and 0.1% TritonX-100 (PTA), suited by blocking in block-PTA (6% normal goat serum (Sigma-Aldrich, St. Louis, MO, USA) in PTA) for 2–4 h or overnight. The primary antibodies, polyclonal rabbit anti-serotonin (INCSTAR, Stillwater, USA, dilution 1:500), polyclonal rabbit anti-FMRFamide (Acris Antibodies GmbH, Herford, Germany, dilution 1:500) and monoclonal mouse anti-acetylated α-tubulin (clone 6-11B-1, Sigma-Aldrich, St. Louis, USA, dilution 1:500) were applied for 48–72 h in block-PTA. Afterwards, specimens were rinsed in block-PTA for 3 × 2 h and incubated subsequently with secondary fluorochrome conjugated antibodies (goat anti-rabbit Alexa Fluor 488) in block-PTA for 24–48 h. At last, the samples were washed three times in 0.1 M PBS (without NaN3). Subsequently the samples were mounted between two cover slips using 90% glycerol/ 10% 10× PBS containing DABCO or Vectashield Mounting Medium (Vector Laboratories, Burlingame, USA) (for Apistobranchus). Negative controls were obtained by omitting the primary antibody in order to check for antibody specificity and yielded no fluorescence signal. Specimens were analyzed with the confocal laser-scanning microscope Leica TCS STED (Leica Microsystems, Wetzlar, Germany). Confocal image stacks were processed with Leica AS AF v2.3.5 (Leica Microsystems). The final panels were designed using Adobe (San Jose, CA, USA) Photoshop CC and Illustrator CC. Ten morphological characters were defined as primary homologies in order to reconstruct the ancestral states of the annelid ventral nerve cord. All characters are defined as binary and their codings and relevant references shown in the data matrix of Fig. 6. Codings are based on the newly generated data unless references are provided in Fig. 6. Figure 5 represents a mapping of these morphological characters and the resulting ancestral state reconstructions on a simplified topology based on our molecular analyses. Inapplicable character codings are applied to characters 3 and 7–9 for taxa coded as absent in characters 2 and 6, respectively. However, inapplicable codings are treated as missing data in our ancestral character reconstruction, which is why all character states were reconstructed for all taxa in Fig. 5 even though characters 3, 7–9 for some extant taxa may have to be technically considered as inapplicable. The ventral nerve cord of Annelida can be located within the epidermis (= intraepidermal, state: 1) or outside the epidermis (= subepidermal, state: 0). Intraepidermal cords are embedded within epidermal tissue and surrounded by epidermal cells. The basal lamina delimits the epidermis (including the ventral nerve cord) from the remaining non-epidermal tissue. Somata of the ventral nerve cord can be clustered (= present, state: 1) or non-clustered (= absent, state: 0). Non-clustered somata don’t show any sign of aggregation, are evenly distributed along the nerve cord, and a neuropil is present along the entire nerve cord. If the somata along the ventral nerve cord are clustered according to character 2, single somata can still appear between these clusters (= present, state: 1). The latter somata are not part of the cluster, but belong to the ventral nerve cord. If somata between the clusters are absent (= absent, state: 0), these inter-clustal parts of the ventral nerve cord are called somata-free connectives. If the somata in character 2 were scored as non-clustered, they would here be scored as inapplicable. The commissures along the ventral nerve cord, interconnecting both parallel cords, can be arranged in a quite random series not following a strict seriality (= absent, state: 0) or in a strict segmental pattern (= present, state: 1), congruent to the serial repetition of other structures. In both cases faint and prominent commissures are counted with the same weight. The somata forming the ventral nerve cord can be monomorphic (= absent, state: 0) or polymorphic (= present, state: 1). Within the ventral nerve cord giant fibers can be absent (state: 0) or present (state: 1). These fibers are characterized by their larger diameter in comparison to other neurites forming the ventral nerve cord and run along the entire length of the ventral nerve cord. Giant fibers within the ventral nerve cord can be exclusively located in a ventral position (= present, state: 1), or they can have another localization (= absent, state: 0). If giant fibers are lacking, the character is coded as inapplicable. Giant fibers can be present as a pair (= absent, state: 0) or be numerous (= present, state: 1). If giant fibers are lacking, the character is coded as inapplicable. Giant fibers in the ventral nerve cord can be separate (= absent, state: 0) or partly fused (= present, state: 1) throughout the trunk. If giant fibers are lacking, the character is coded as inapplicable. In close proximity to the ventral nerve cord additional longitudinal neurites can be present (state: 1) or absent (state: 0). Notably, these additional longitudinal neurites arise from the brain and do not branch off from the ventral nerve cord. Ancestral states for separate characters of the ventral nerve cord were reconstructed in Mesquite v. 3.10 . In a first analysis a parsimony approach with characters treated as unordered was used. A second analysis was carried out using a maximum likelihood reconstruction showing proportional likelihoods under the Mk1 model with branch lengths scored as equal. Both reconstructions were based on a simplified topology of the MARE1.5-tree (Fig. 1), the underlying topology was predefined by hand and potential annelid sister groups were not included due to the unresolved annelid sister group. Results of both analyses were highly similar and only the maximum parsimony reconstruction is shown in the main text. A summary, where these MP reconstructions are mapped on a simplified topology of Fig. 1, is shown in Fig. 5, and the actual ancestral state reconstructions (for both methods and each character) are provided as Additional file 3: Figure S4 (MP reconstruction) and Additional file 4: Figure S5 (ML reconstruction). Reconstruction of the characters on the MARE 2.0-tree (Additional file 5: Figure S3) was not shown, but the only discrepancy found (character 6) was discussed in the text. To test for the influence of potential annelid sister groups on the ancestral state reconstruction, MP analyses were also performed with either Mollusca, Nemertea, Phoronida or Brachiopoda as potential annelid sister groups. The detailed results are given in the Additional file 6: Figure S6 (for Mollusca), Additional file 7: Figure S7 (for Nemertea), Additional file 8: Figure S8 (for Phoronida) and Additional file 9: Figure S9 (for Brachiopoda). Two supermatrices were used for phylogenetic analysis, which differed in the number of included gene partitions. 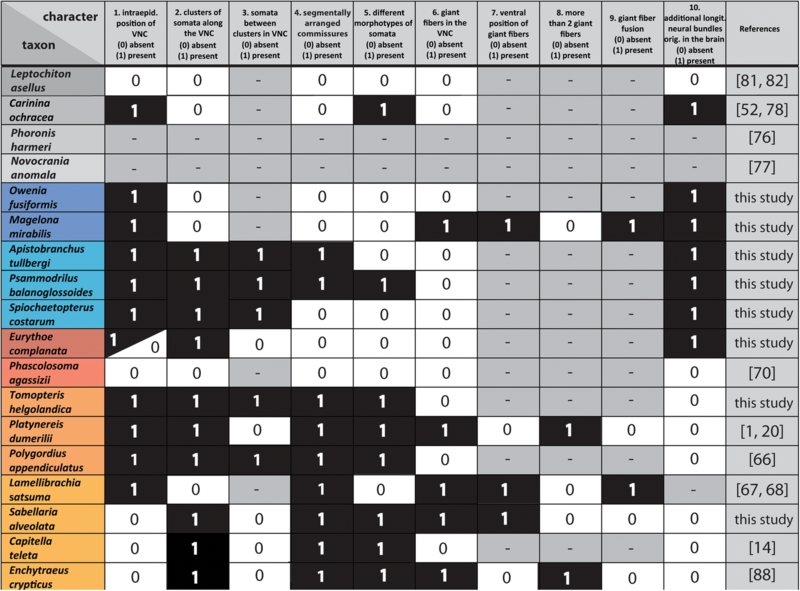 Using the weighting parameter α = 2 resulted in a matrix containing 404 of the original 1,253 gene partitions, comprising 128,186 amino acid positions for the 40 analyzed taxa (MARE2 dataset). Applying the less strict weighting parameter α = 1.5 kept 490 partitions for the final supermatrix (MARE1.5 dataset), comprising 159,297 amino acid positions. With 90.1% (MARE2) and 90.6% (MARE1.5), the completeness of the matrix is similar for both data sets and clearly improved compared to the unreduced supermatrix (24.2%). Maximum Likelihood analyses using a partition scheme and models as optimized by IQ-TREE  resulted in two slightly different topologies (Fig. 1, Additional file 5: Figure S3). Consistent with previous analyses [28, 29, 32], both data sets yielded a monophyletic Annelida, which can be broadly classified into Pleistoannelida (comprising Sedentaria and Errantia) as well as a number of basally branching lineages (see Fig. 1). As in previous analyses (see ), Sipuncula + Amphinomida are recovered as sister taxon to Pleistoannelida. Interestingly, we find Apistobranchidae and Psammodrilidae together with Chaetopteridae in a well-supported (100% bootstrap) clade among the basally branching lineages. Accordingly, the clade is herein named ‘Chaetopteriformia’ due to the well-supported placement of Apistobranchidae and Psammodrilidae together with Chaetopteridae. ‘Formia’ is derived from ‘forma’, which means ‘shape’, and follows previous naming for groups of annelid families such as Aphroditiformia, Cirratuliformia, Terebelliformia (see e.g., ). The naming is so far node-based and further morphological investigations (including the herein presented data) will help to provide a proper description and test for morphological apomorphies of this group in the future. Apistobranchidae and Psammodrilidae had not been included in previous phylogenomic analyses of annelid relationships and previous morphological investigations suggested them being positioned within Sedentaria mainly based on the structure of the palps, coelomic cavities or chaetal characters [57–60]. Due to the lack of detailed morphological investigations, morphological characters supporting the clade Chaetopteriformia are missing so far. Nevertheless, characters such as the arrangement of muscle bundles in the body wall, the presence and shape of internal chaetae or the partitioning of the trunk (heteronomous segmentation) should be analyzed in detail in future studies as they are candidates for putative morphological synapomorphies supporting the monophyly of Chaetopteriformia (see also  for review). In our analysis Psammodrilidae represent the sister taxon of Chaetopteridae, but the bootstrap support for this hypothesis is rather weak (bootstrap 72 & 78%, respectively). Nevertheless, the clade Chaetopteriformia and its position as sister group of (Sipuncula + Amphinomida) + Pleistoannelida (Errantia + Sedentaria) is maximally supported (Fig. 1, Additional file 5: Figure S3). The two analyses only differ with respect to the sister taxon of all other annelids. In the MARE1.5 analyses (which contains more characters) Magelonidae and Oweniidae form the clade Palaeoannelida , which constitutes the sister group of all remaining annelids (see Fig. 1). This result is consistent with previous phylogenomic studies [29, 31, 61]. In contrast, in the MARE2 analysis, Oweniidae and Magelonidae branch off successively in the ML tree (Additional file 5: Figure S3). However, in the bootstrap analysis the support for this latter topology is low, whereas the alternative hypothesis Palaeoannelida received higher support (bootstrap 84%). Therefore, we focused on the topology recovered by the MARE1.5 analysis for reconstructing the evolution of the VNC (Fig. 5), but discuss the few discrepancies found from the reconstructions performed on the MARE2-tree. In the following we refer to Richter et al. regarding the terminology of neuroanatomical characters. Differing definitions are stated appropriately. Neuroanatomical characteristics of the VNC were observed in whole mounts of at least 5–10 adult specimens per species via immunohistochemistry and verified using histological series of sections and TEM in representative trunk regions. In particular, the position of the VNC in relation to the epidermal extracellular matrix (ECM), the arrangement and location of neurite bundles within the VNC and their respective immunoreactivity as well as the morphology and arrangement of neuronal somata in the VNC and the occurrence of somata-free areas were scored. Although different species per family were investigated and the coverage of morphological diversity within a family was given priority, it has to be kept in mind that the taxon sampling represents only a subset of the diversity within the respective families. Our study revealed an intraepidermal VNC for all investigated species of Oweniidae (Figs. 2a, b, e), Magelonidae (Figs. 2g, h), Apistobranchidae (Figs. 3a, b), Psammodrilidae (Figs. 3f, h) and Chaetopteridae (Figs. 4a-c). These findings are concordant with previous investigations [33, 36, 42, 63, 64]. In species of Amphinomidae, the anterior part of the ventral cord is intraepidermal (Fig. 4g), whereas the posterior part is located subepidermally within the musculature (Fig. 4h, i), but still surrounded by a continuous ECM connected with the epidermal ECM (Fig. 4i). Immunostainings against serotonin (5-HT) and FMRFamide as well as histological serial sections with subsequent 3D-reconstruction reveal a paired VNC within the first chaetiger in adult Oweniidae (Figs. 2a, d, f), whereas both neurite bundles form an unpaired mid-ventral cord containing a single neuropil in trunk chaetigers (Figs. 2b, d, f). Nevertheless, a bilaterally organized pair of neurite bundles showing certain immunoreactivity is detectable within this unpaired cord (Figs. 2d, f). An additional median neurite bundle is absent (Fig. 2b). 5-HT-LIR is present throughout the entire VNC (Figs. 2d, f). Notably, the somata are monomorphic (based on immunohistochemistry, histology and TEM), and scattered randomly along the ventral cord. The latter somata do not form distinct clusters - a result also supported by DAPI staining (Fig. 2f, inset) and histology (Fig. 2c). However, developmental studies in Owenia fusiformis reveal seriality of repeated 5-HT-LIR somata (Fig. 2d)  and investigations in adult Galathowenia oculata exhibit posterior somata clusters showing selective immunoreactivity . Nevertheless, the latter results are not in contrast to the herein presented observations; they, illustrate the developmental complexity on the one hand, but also the necessity of a multi-methodological approach on the other hand, as well as the importance of future analyses of larval and juvenile stages in Oweniidae. Taken together, ganglia as defined by Richter et al. were not observed. In Magelonidae, immunohistochemistry reveals a paired VNC consisting of prominent neurite bundles and paired neuropils in thoracic chaetigerous segments (Figs. 2i, j) and a fused ventral cord in the trunk of adults (Fig. 2k). An unpaired bundle of median neurites described previously  could not be observed. Depending on the species both ventral neurite bundles may fuse between the ninth and tenth chaetiger (Fig. 2k). Nevertheless, neurites showing certain immunoreactivity still form paired neurite bundles. 5-HT-LIR (FMRFamide-LIR) is detectable throughout the ventral cord and – together with histology - revealed a non-serial arrangement of somata in the trunk. Somata-free connectives are absent (Fig. 2j, k). Irregularly arranged commissures not following a strict segmental pattern are present (Figs. 2j), and any seriality is missing. Additionally, giant nerve fibers are present in all investigated magelonid species (Fig. 2h). Two parallel giant fibers originate in the brain, encircle the mouth and form a mid-ventral fiber, which runs along the trunk ventral in the main cord (Fig. 2k). To which extent the giant fibers are formed by one single or multiple axons cannot be stated based on the current dataset. However, giant fibers are lacking in most oweniids (Figs. 2a, b), but are found in Myriowenia sp. (Fig. 2b (inset)) where two parallel giant fibers fuse posterior of the mouth (not shown) and run along the entire trunk dorsal in the main nerve cord. In Chaetopteriformia two parallel ventral neurite bundles are present in adult specimens (Figs. 3c, I; 4d). Although these bundles were observed as being separated anteriorly and converge in the posterior trunk, at least in Chaetopteridae, they never form a single mid-ventral neuropil. Serial clusters of monomorphic somata with 5-HT- and FMRFamide-LIR are present, but somata-free connectives are absent at least in Apistobranchidae and Chaetopteridae - a fact supported by histology (Figs. 3c, d; 4d-f). Segmentally repeated commissures interconnect both cords in Apistobranchidae (Figs. 3c, d), whereas mainly segmental commissures as well as randomly arranged ones were seen in Chaetopteridae (Figs. 4d, f). In Psammodrilidae the commissures are segmentally arranged (Figs. 3e, g, i). In contrast to previous descriptions , but based on a comparable and even extended methodological approach, an unpaired midline neuropil is not detectable. Both, Apistobranchidae and Psammodrilidae, show a high degree of neuronal seriality, with only a few additional somata between the serial clusters of somata present in Psammodrilidae (Figs. 3e, g, f). Nevertheless, the nerve cord is intraepidermal in Chaetopteriformia. In Amphinomidae, the trunk nervous system is represented by paired mid-ventral neurite bundles and additional bilateral longitudinal neurite bundles . In the following, solely the median-most nerve fibers are regarded as part of the ventral cord and the lateral longitudinal ones, which are often described to belong to the peripheral nervous system, are not considered here. Thus, tubulin-immunoreactivity showed two ventral neurite bundles throughout the trunk (Fig. 4j). In anterior histological sections these paired neurite bundles form a (partly) fused mid-ventral cord in intraepidermal position and separate neurite bundles were only visible using immunohistochemistry (Fig. 4g). Posterior histological sections reveal two parallel neurite bundles forming the subepidermal cord (Fig. 4h), which, however, is still connected to the epidermis by a continuous ECM. A median neurite bundle and giant fibers are absent (Figs. 4g, h). The somata are clustered in certain parts of the neuropil and form segmental (hemi-) ganglia (Fig. 4k) in accordance with earlier descriptions , somata between the clusters and giant fibers are absent. On the contrary, adult Sipuncula possess an unpaired medullary ventral cord with subepidermal somata and neuropil [66, 67] (see also Fig. 5). Giant fibers are absent. A limited number of studies dealing with nervous system development in Annelida (including Sipuncula) shows that the subepidermal annelid VNC develops from a larval intraepidermal ventral cord [21, 66, 68]. Our analyses (Figs. 5, 6) also support a partial transition of the VNC from an intraepidermal towards a subepidermal position in the common stem lineage of Amphinomidae and Sipuncula, and a complete transition of the VNC towards a subepidermal position along the branch leading to Sipuncula. A shift towards a subepidermal localization could also be observed in several Pleistoannelida (Fig. 5; see also Fig. 7 for Sabellariidae). On the other hand, numerous pleistoannelid groups, e.g., Polygordiidae , Tomopteridae (Fig. 7) or Siboglinidae [70, 71] and several other taxa bear a medullary-like VNC in intraepidermal position  (Fig. 5). However, many annelid groups are poorly investigated and developmental studies are necessary to back-up the findings observed in the adult ventral cord. Our analyses using the MARE1.5 topology reconstruct an intraepidermal position of the VNC equipped with monomorphic somata to be the ancestral condition in Annelida (Fig. 5). Whether medullary arranged somata and non-segmental commissures were features of the last common annelid ancestor cannot be reconstructed unambiguously based on the current data and is highly dependent on the potential annelid sister group (Fig. 5; Additional file 6: Figure S6, Additional file 7: Figure S7, Additional file 8: Figure S8, Additional file 9: Figure S9). Nevertheless, the last common ancestor of Pleistoannelida most likely also had an intraepidermal nerve cord, but with somata clusters, intermediate somata and different morphotypes of somata. Moreover, giant fibers did not occur in the last common ancestor according to the reconstruction based on maximum parsimony (nevertheless equivocal with ML ancestral state reconstruction). However, the existence of giant fibers in at least one member of the early branching Oweniidae (but not our coded O. fusiformis) and in all investigated Magelonidae, but lack of such neuronal structures in the remaining early branching lineages, makes it difficult with the current taxon sampling to reconstruct the evolution of this character and the associated characters definitely (Fig. 5). Furthermore, their characterization mainly by diameter  and their variable location relative to the VNC when comparing Paleo- to Pleistoannelida add to this problem. Nevertheless, presence of such structures in members of Paleoannelida provides some support in the ML ancestral state reconstruction (Additional file 4: Figure S5) to the scenario that giant fibers could belong to the annelid ground pattern. Due to the occurrence of giant fibers in only one oweniid species and the unresolved placement of the respective taxon within the oweniid tree, a final statement regarding the evolution of the giant fibers is hardly possible based on the data available. Based on our analyses, a transition of the VNC into a ladder-like, cluster-bearing VNC with a subepidermal position seem to have evolved independently in a few lineages after the split of Pleistoannelida into Errantia and Sedentaria. A ladder-like, cluster-bearing, subepidermal VNC therefore has to be considered the derived condition within Annelida. The features of the VNC we predict for the annelid ground pattern are therefore differing from the commonly accepted, strict subepidermal ladder-like configuration (meaning somata only within the paired ganglia, paired somata-free connectives and segmentally arranged commissures). This strict configuration has often been used to picture the ancestral annelid ventral nervous system and was largely based on the erroneous interpretation of the clitellate VNC as being the best fitting model for representing the annelid organization [1, 20]. Nevertheless, a ladder-like but intraepidermal cord can be observed within Chaetopteriformia (in Psammodrilidae and partly in Apistobranchidae) as well as in several Pleistoannelida, and therefore it has to be assumed that the transition into this ladder-like condition occurred several times during annelid evolution. These presumably multiple transitions into a ladder-like appearance seem to show an evolution independent from the observed transition from an intra- towards a subepidermal position of the cord. Notably, the position of the VNC is correlated with the arrangement of the body wall musculature. Generally, the longitudinal musculature is arranged in 2–3 pairs of bundles, in the ventral midline often separated by the VNC [73–75]. A body wall musculature consisting of inner longitudinal and dense outer circular muscle, as described for, e.g., burrowing Arenicolidae or members of Clitellata, was always thought to be part of the annelid ground pattern but is only present in a limited number of taxa. In addition, these are usually found in highly derived positions in the phylogenetic tree. Yet, such a body plan of ground-dwelling annelids is now found to be highly derived  and the subepidermal position of their ventral nerve cord may either be a protective adaptation to the mechanic stress during burrowing or related to the necessity of a well-developed system of circular muscle fibers. Notably, in species with an intraepidermal VNC, the ventral longitudinal muscle bundles are usually separated from each other by the VNC and true circular musculature forming closed rings of fibers is absent [74, 75]. A significant change in lifestyle, e.g., towards a more actively burrowing behavior in sediments like soil as depicted by numerous sedentary worms, or the exploitation of new food sources as seen, e.g., in predatory leeches, might have caused adaptive changes of the body wall musculature to fulfill specific movements required for this lifestyle. This might have triggered the necessity of a better protection of the nervous system, which caused a positional shift of the VNC. The latter or a similar scenario might help to explain the positional changes observable in the annelid VNC and is supported by comparable hypotheses dealing with the evolutionary transition of the brain in sediment-dwelling taxa towards posterior caused by the burrowing lifestyle . Nevertheless, detailed investigations are necessary to point out the actual driving force for this major morphological change during annelid and spiralian evolution. 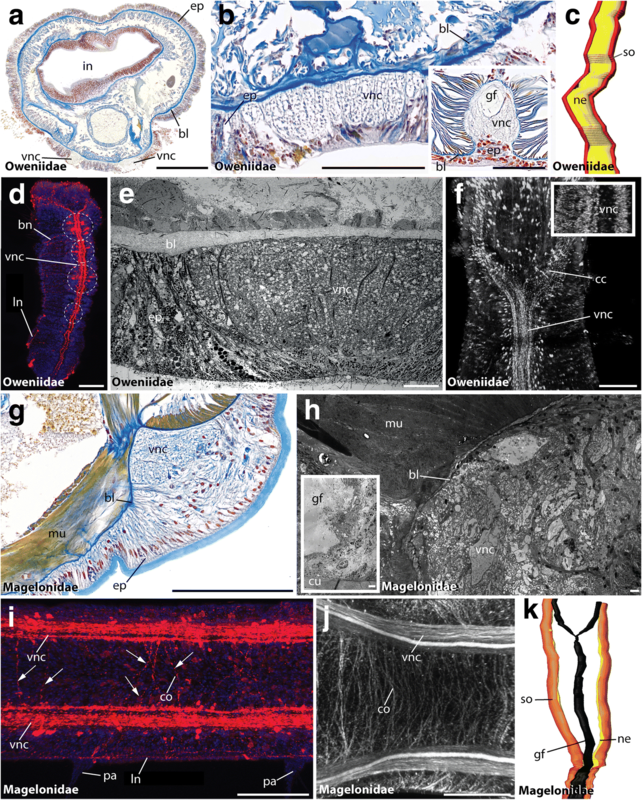 The evolution of the centralized nervous system within Bilateria is still a highly discussed field, and even similarities in terms of development and patterning of the ventral nerve cord in Spiralia are questioned in recent analyses – also due to lack of morphological data and comparable characters of the ventral nerve cord in various taxa [76–78]. Although our results support an intra- or basiepidermal VNC and show the equivocal probability of somata occurring along the entire nerve cord as being the plesiomorphic annelid condition, the origin of the latter character state within Spiralia can hardly be reconstructed since the sister group of annelids is still not resolved [79, 80] (see also S6-S9 for ancestral state reconstructions including the potential sister group). Whereas either Nemertea or Mollusca were generally considered the annelid sister taxon [81, 82], recent analyses reveal Brachiopoda and Phoronida as additional candidates [30, 80]. In the latter, adults lack a VNC [83, 84], but the nervous tissue within the lophophore is well developed and has an intraepidermal position as well. When using Brachiopoda/Phoronida as annelid sister group in the ancestral state reconstruction (MP analysis), the ground pattern of the annelid VNC includes an intraepidermal position of the VNC, monomorphic somata, a ventral position of giant fibers and additional longitudinal neurite bundles. Nevertheless, presence of giant fibers in general and more than two giant fibers is not supported by the MP analysis (Additional file 3: Figure S4) (but their absence/presence is traced equivocally in the ML analyses; Additional file 4: Figure S5). Nemertea do not exhibit distinct medio-ventral neurite bundles, but bear lateral medullary neurite bundles without strict somata clusters . Both lateral neurite bundles are intraepidermal in the supposedly early branching Carininidae . When using Nemertea as potential sister group for Annelida, the MP ancestral state reconstruction favors an intraepidermal position of the annelid VNC, a ventral position of giant fibers and the presence of additional longitudinal neurites as well. Somata clusters, segmentally arranged commissures, different somata morphotypes and giant fibers in general might be absent in the annelid ground plan based on the MP analysis (Additional file 7: Figure S7). 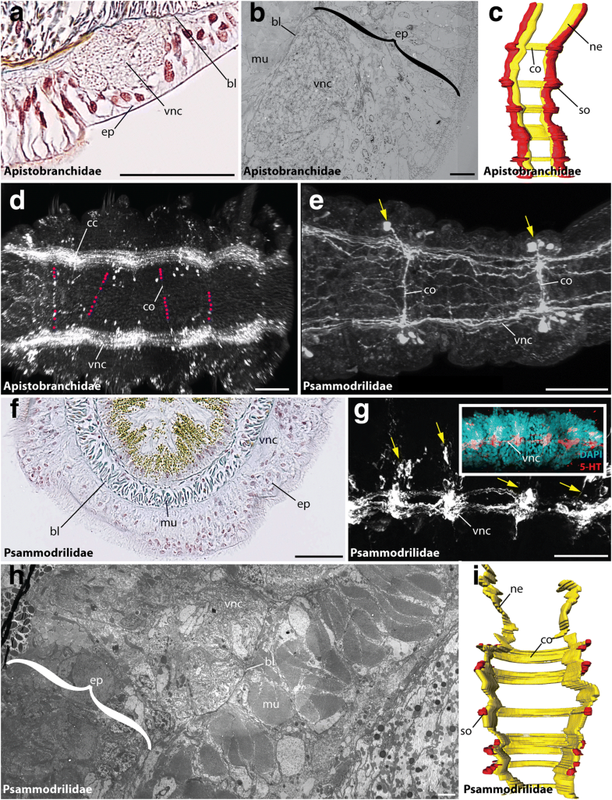 Mollusca show a considerable variation in nervous system organizations, but the proposed mollusc ground pattern comprises a subepidermal nervous system out of four medullary cords, which are laterally and ventro-laterally positioned [86–89]. An inclusion of Mollusca into the analysis supports the lack of somata clusters, serial commissures following a strict segmental pattern of related structures and different somata morphotypes, but an intraepidermal position is questioned due to the subepidermal conditions of the VNC in molluscs. (Additional file 6: Figure S6) Yet, a subepidermal cord with distinctive somata clusters containing segmentally arranged commissures and with somata-free connectives in between is not depicted as the ancestral annelid configuration in none of the previously mentioned analyses (Fig. 5). Notably - as discussed above - such a configuration is also lacking in the supposed annelid sister groups [83–85, 88]. In numerous annelids the neurite bundles of the VNC are located ventro-laterally in early developmental stages (and in several lineages of interstitial or meiofaunal annelids), but mid-ventrally in adults [20, 71, 90–92]. Regardless of the annelid sister group a positional shift of the lateral neurite bundles towards the ventral midline has to be assumed to have evolved in the stem lineage of Annelida. According to our tree a similar transition must be hypothesized for the position of the VNC in Annelida. Here, the developmental shift of the annelid VNC from an intra- into a subepidermal position provides an explanation for the repeated evolutionary transition of the VNC from the epidermis into deeper layers. Taken together, our study illustrates the complexity when it comes to evolutionary changes of organ system morphologies, but also shows the importance of phylogenetic analyses to test alternative hypotheses, e.g. regarding the direction of evolution. Based on the presented data an intraepidermal ventral nerve cord not only exhibits a larval and juvenile character as described previously for many annelid groups, but also reflects the putative plesiomorphic annelid condition. Accordingly, this condition is not (only) the result of paedomorphosis, as it was supposed for various annelid groups. Furthermore, profound scenarios concerning the evolutionary direction of changes in a respective organ system are solely possible under consideration of a comprehensive methodological approach, but also strongly limited by insufficient comparable datasets. In case of the ventral nerve cord in Annelida, further anatomical investigations are necessary to provide a better taxon sampling and data acquisition especially within the pleistoannelid groups. Only based on additional analyses open questions such as the evolution of giant fibers or the VNC transition from intra- towards subepidermal within Pleistoannelida can be resolved adequately. Thus the current study thereby provides important starting points for future investigations. We thank the Sars International Centre for Marine Molecular Biology (Bergen/Norway), in particular H. Hausen for discussions and specimens of Apistobranchus tullbergi for TEM and the team of S11 for continuous support. We thank Pat Hutchings (Sydney/Australia) for specimens of Myriowenia, Anett Karl (Leipzig, Germany) for TEM images of Owenia fusiformis, Nadya Rimskaya-Korsakova for helpful comments on the siboglinid nervous system and Helge Norf (Leipzig/Germany) for help with the collection of Hypania invalida. Furthermore, we would like to thank the Arctic Station Greenland (Qeqertarsuaq, Disko, Greenland) and the biological station Roscoff (Roscoff, France), in particular Stephan Hourdez (Roscoff, France), for help and support during various collection trips. We acknowledge support by the German Research Foundation and the Open Access Publication Funds of the Göttingen University. CH was financed by personal research fellowships from the DFG (HE 7224/1–1, HE 7224/2–1). This work was also funded by the DFG during the AnnEvol-project (grants DFG- STR 683/5–2 and DFG-STR 683/8–2 to THS; grant DFG-BL 787/5–1 to CB). This is NHM Evolutionary Genomics Lab contribution #12. All data generated or analysed during this study are included in this published article and its supplementary information files. The assembled molecular datasets underlying the phylogenetic analyses are available in the Dryad digital repository; . CH and CB conceived the study, analyzed the data and drafted the manuscript. AW, THS and CB performed molecular analyses. CH, PB, TB, SHD, IK, GP and KW performed morphological investigations or data analyzes and contributed specimens or raw data. All authors discussed, read and approved the final version of the manuscript. Ethics approval and consent to participate were not required for this work. Maddison WP, Maddison DR. 2011 Mesquite: a modular system for evolutionary analysis. Version 3.10. http://mesquiteproject.org . Helm C, Beckers P, Bartolomaeus T, Drukewitz SH, Kourtesis I, Weigert A, Purschke G, Worsaae K, Struck TH and Bleidorn C. 2018 Data from: Convergent evolution of the ladder-like ventral nerve cord in Annelida. (https://doi.org/10.5061/dryad.6467hv5).